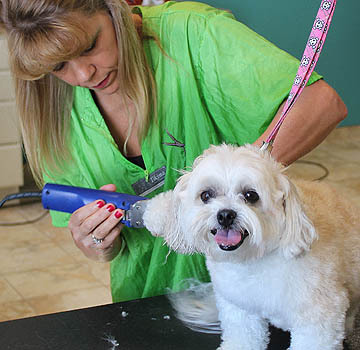 Our Peoria site offers a state-of-the art grooming salon for your pet of any size to receive the total spa experience. For our cat and dog grooming clients, we offer the highest quality grooming products in the industry and treat each dog as an individual with individual needs. Your pet will enjoy a luxurious bath with special cleansers that will remove dirt and debris. Following a tender hand washing, your pet will be fresh and revitalized. Brightening baths, oatmeal baths, and furminating baths are also available depending on your pet's needs. Our service also includes nail trimming/grinding and ear cleaning. As a Professional Dog and Cat Stylist, Debby Weishaar (pictured above) brings 30+ years of experience to Tender Care Animal Hospital of Peoria. Professional Dog and Cat Stylist, Hanna Miller brings 10+ years of experience to Tender Care Animal Hospital of Peoria. Prices are based on pet size, breed, and coat length. Talk to our knowledgeable staff to customize your dog and cat's experience. Includes face, feet and fanny trim for puppies under 5 months. This is a great way to introduce your puppy to the grooming process! Cleansing bath, toenail trim, ear cleaning, glands and full haircut. Please call for pricing. Cleansing bath, toenail trim, ear cleaning, glands and a trim on all edges. Please call for pricing. Cleansing bath, toenail trim, ear cleaning, glands and brushing. Please call for pricing. In addition to grooming, this treatment helps reduce shedding. It includes special shampoo, conditioner, and a shed tool that is used to remove undercoat. Please call for pricing. 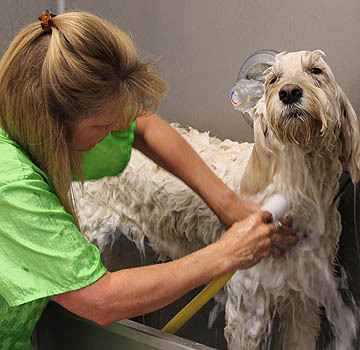 We also offer special shampoos and conditioners to meet the individual needs of your pet. In addition to trimming your pet's nails, we use a special tool that can help those nails get smoother and shorter. Please call for pricing. For grooming questions, please call (309) 243-1755. "Dr. Larson and Dr. Waggoner are wonderful, compassionate vets. Debbie does a wonderful job grooming our pets. From skin issues to upper respiratory infections to parvo they have taken wonderful care of our pets and would highly recommend this practice to anyone." - Lisa B. "Awesome care and best groomer in Peoria! Thanks Debbie!" - Colette C.